Even those who believe before Baptism, or who came to faith through Baptism, believe through the preceding, outward Word. Adults, who have come to reason, must first have heard: “He who believes and is baptized will be saved,” even if they did not immediately believe, and received the Spirit and Baptism ten years afterwards. That someone could believe in someone or something that they have never heard of is an absurd notion. How can anyone believe in Christ without having heard of him? How could they have known of him without an external word? God’s external Word is required for faith to take hold. A so-called internal word is the stuff of fantasy, the spiritualism run amok in our society. It says, there are many ways up the mountain; how dare you say there is one way? The internal word declares, my way is as valid as anyone’s. This internal word is the basis of the blind conceit that surrounds us in our society. All the while, true faith looks intently at a single source of revelation: the external Word of God. 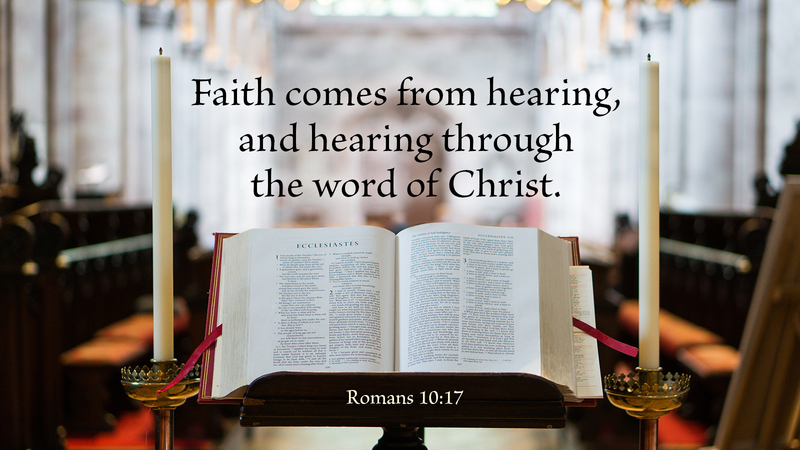 Whether it is delivered by a preacher in a sermon or by the Spirit in reading Scripture, it is this external word alone that God uses to bring people to faith, and to keep them in the faith. Prayer: Open my eyes and ears, Lord, that I may see and hear you through your Word. Amen. This booklet provides a suggested list of Bible verses, prayers, and familiar worship texts assigned to various age levels, recommended for use along with Sola Publishing’s Sunday Schoolhouse curriculum series. 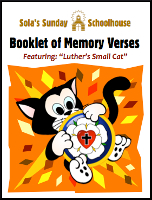 The order of texts matches the suggested grade levels in Luther’s Small Cat Series: elementary-aged curriculum on Martin Luther’s Small Catechism, also available from Sola Publishing.